Buying a mattress isn’t the kind of split second decision you want to make. There are a lot of options to choose from and the last thing you want is to be sleeping in a bed that’s not comfortable. At John Ryan By Design we sell high-quality mattresses that are built to provide a long-lasting experience. Our reputation is based on the knowledge we’ve acquired over the years of being in the mattress industry. Personal service is at the heart of what we do, ensuring you understand the mattress buying process. Materials, size and quality are all taken into account. Every detail counts in our opinion, so we’ll make sure you have all the necessary information. The attention to detail extends to every product, including our range of luxury small double mattresses. The collection is filled with all kinds of mattresses, such as Natural Fibre pocket sprung and Man Made pocket sprung. The size and weight of a double mattress is crucial to understanding whether it will suit you or not. If any have questions about the dimensions of a double mattress then we’ll answer them. When you know the right dimensions you’ll be able to decide which mattress is best for you. What types of small double mattresses do we offer? Our collection of double mattresses is substantial, and as comfortable as they are cost-effective. Our best-selling Origins Pocket 1500 is a perfect example of the quality of our mattresses. This pocket spring mattress is known for providing plenty of back support. 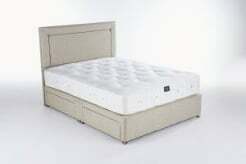 It’s ideal for anyone who is looking for an affordable double mattress and comes with a three year guarantee. If you’d like a bespoke product, then the Artisan Naturals is an excellent choice. The mattress is crafted with a Vanadium coating, giving an extra level of support. The Artisan Naturals comes with a 10 year guarantee. Why purchase a John Ryan mattress? We aren’t interested in a smoke and mirrors approach to selling mattresses. From the moment you decide to buy a mattress, we’ll give you an honest recommendation. Whether you’re unsure about the price, material or size of a product, we’ll answer all your questions. A key part of our business is the 60 day ‘Love It or Return It’ guarantee. If you aren’t satisfied with a new mattress in 60 days then we’ll come and collect it free of charge and refund you in full. Having a mattress that doesn’t meet your expectations is pointless. It’s why we want to hear from you if there’s something wrong and why the 60 day guarantee is in place. If you’d like any further information on buying a double mattress then get in touch with us on 0161 437 4419.